Take I-45 south to Galveston.. Continue straight down Broadway until you reach the beach. Turn left to Ferry Road (two stop lights). Left again on Ferry Road to the Ferry landing. It takes the free Ferry 13 minutes to travel across Galveston Bay to Bolivar Peninsula. When you get off the Ferry you are on Highway 87 at the community of Port Bolivar, home of the Bolivar Lighthouse and the North Jetty, famous for fishing. 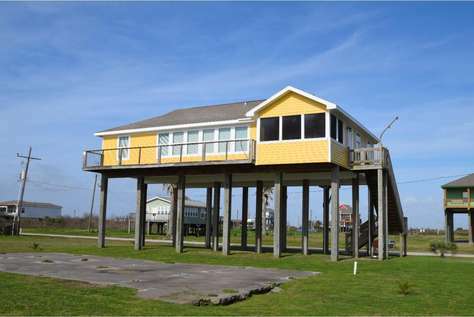 Crystal Beach is northeast on Highway 87 about 10 miles from the Ferry Landing. Take I-10 East to Winnie and follow directions as per Beaumont below. Take I-10 West to Winnie, then head south on Highway 124 until you come to the beach road, Highway 87. Turn right, go about 7 miles to the bridge at Rollover Fishing Pass in the community of Gilchrist. After the bridge, it is 6 miles to Crystal Beach.